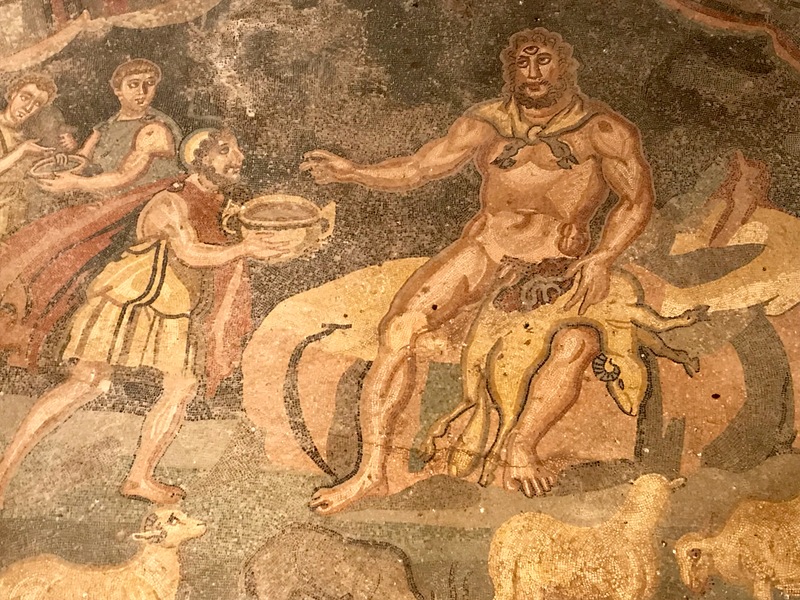 One thousand and six hundred years ago, a wealthy and powerful Roman government official built a splendid villa in the hills of south eastern Sicily, close to the modern-day town of Piazza Armerina. 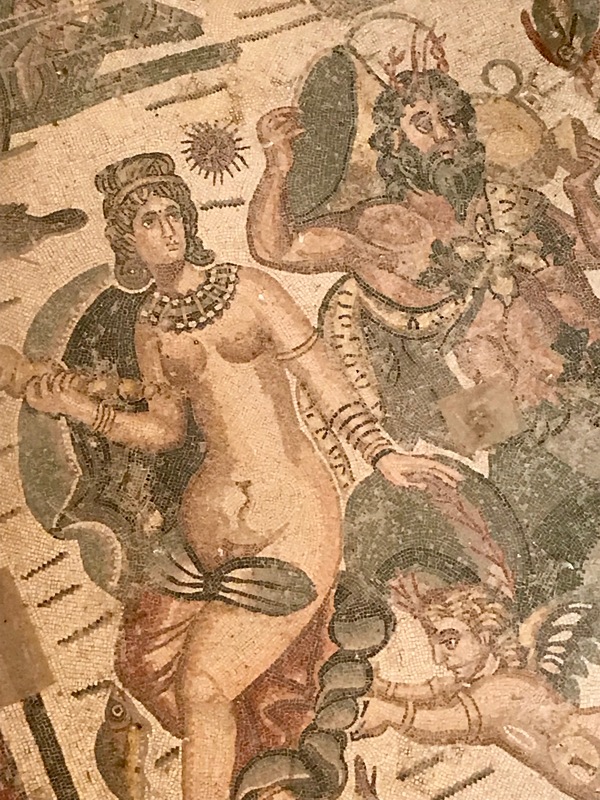 The owner was clearly a man of stature, used to having the finest things life could offer, and wealthy enough to employ a small army of artists from North Africa to decorate his home with a collection of the most extraordinary mosaics imaginable. 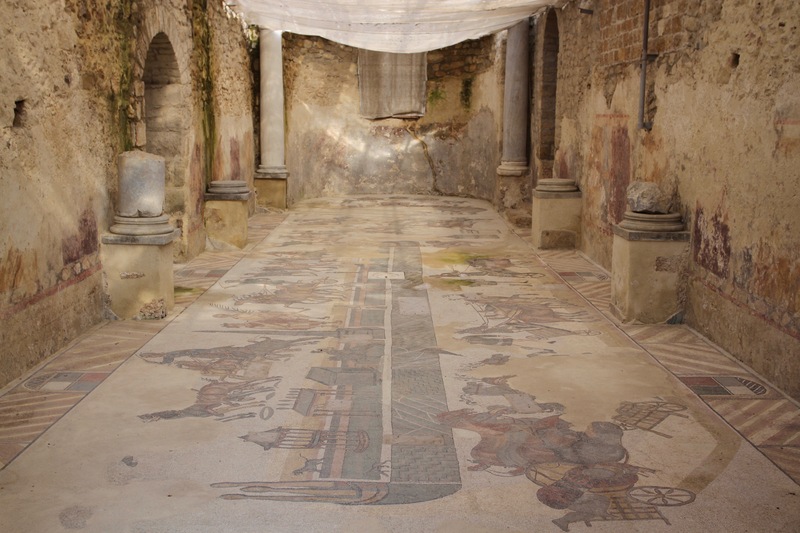 In total, some forty-five rooms – or more than 3,500 m2 – of the sprawling complex are covered in mosaics. The energy, artistry and money that was poured into creating such masterpieces is mind-boggling. Even in decadent Rome, the Villa Romana del Casale seems extravagant. 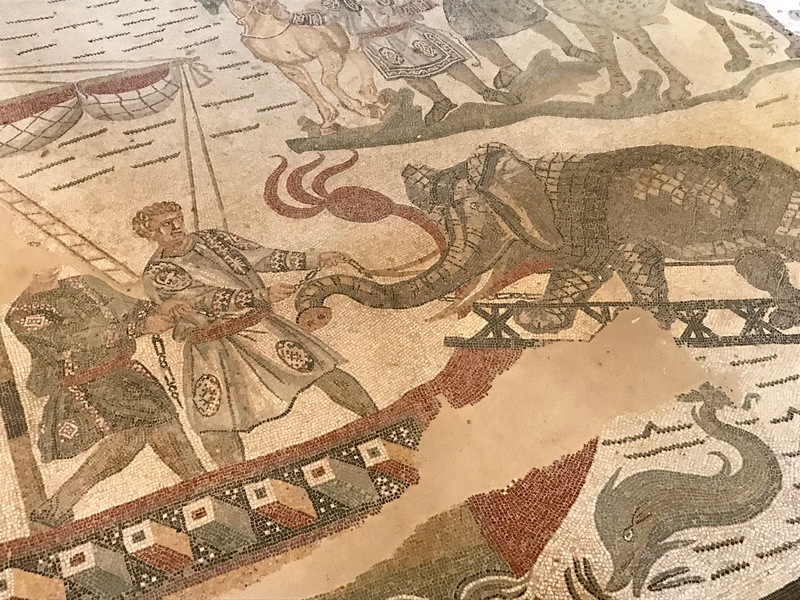 Even more impressive, many of the mosaics have survived time and tribulation to make it to the 21st century. 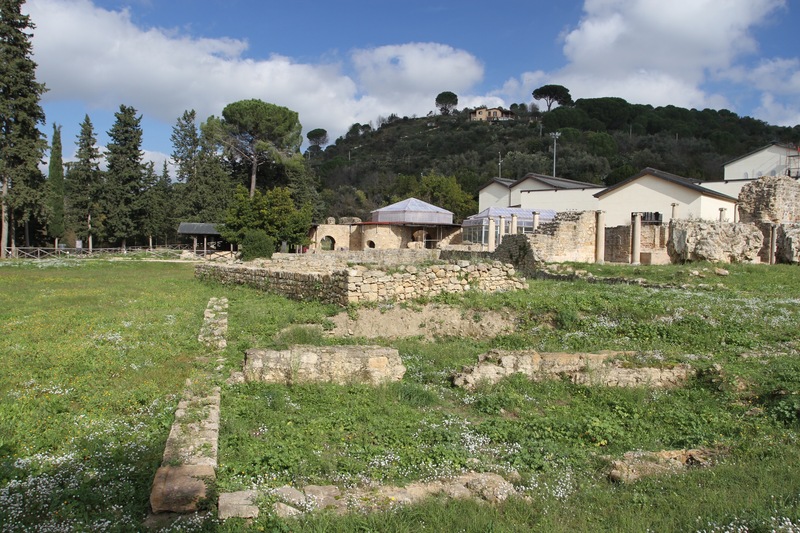 It is one of the finest, best preserved Roman villas to have survived from antiquity. 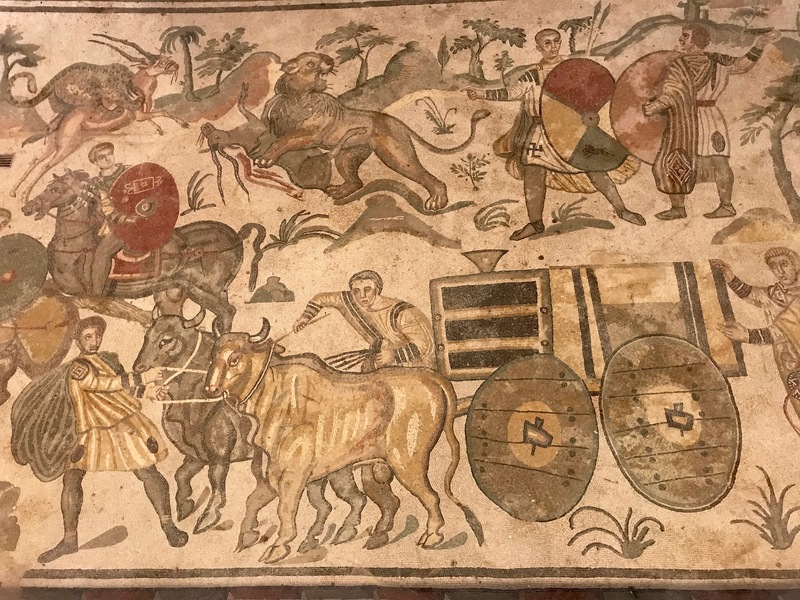 UNESCO, who made this a World Heritage Site in 1997, say simply that they are “the finest mosaics in situ anywhere in the Roman world”. It’s hard to disagree. I’m not sure what we expected when we arrived, but we left feeling profoundly uplifted. It is a truly magnificent place and the sense of wonder stayed with us for days. Which I consider reward for a journey that was blighted by the satnav sending us down a series of minor roads. At one point we found ourselves in the middle of a herd of cows and a bemused Sicilian farmer. 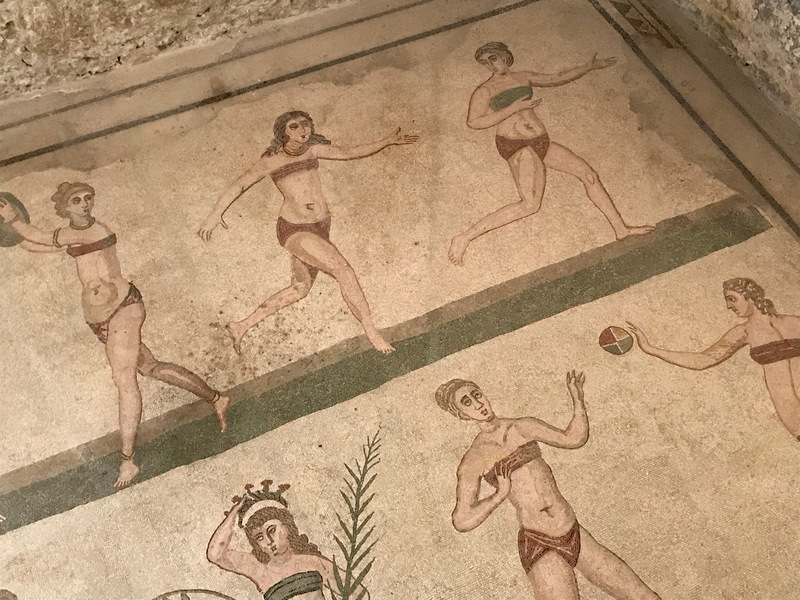 The Villa Romana del Casale is set in a green and fertile valley and, if you’re fortunate enough to arrive when there aren’t any tour groups, you can still get a sense of the tranquility that must have existed all those centuries ago. It’s easy to understand why a wealthy Roman would want to live here. 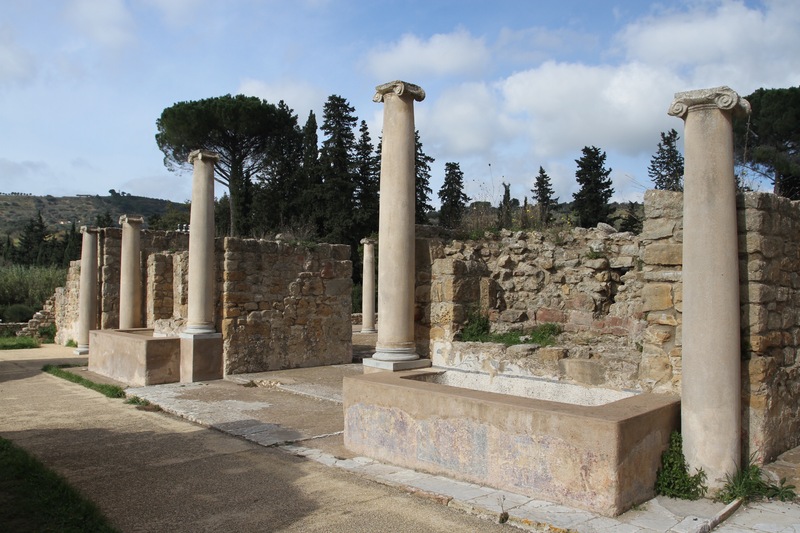 The villa was huge, more than fifty rooms, a large bath complex, and a remarkably decorative Christian Basilica with Egyptian pink granite columns, and a floor of marble sourced from across the Mediterranean. Marble was the most valuable and prised building material of the time, but the mosaics are the number one attraction these days. 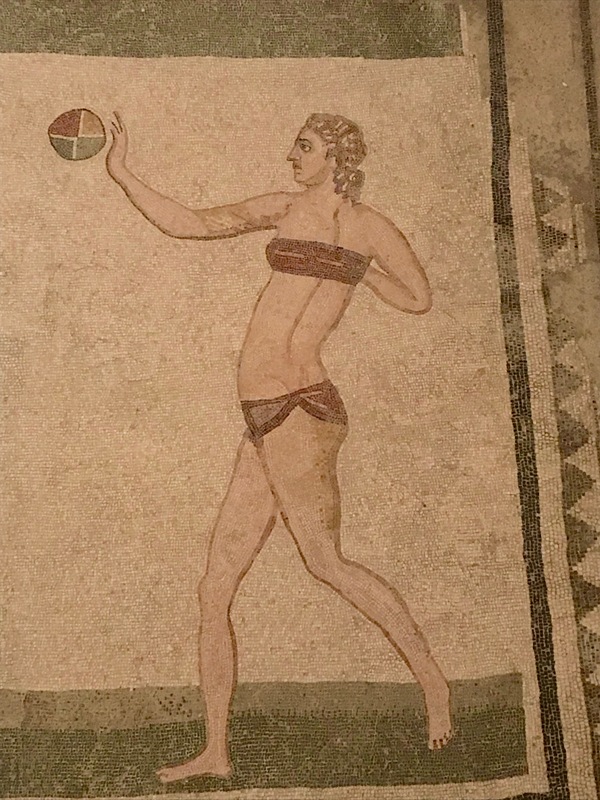 Perhaps the most famous of all is the room named the Chamber of the Ten Maidens, which depicts female athletes attired in what, to the modern eye, look like bikinis. Sporting scenes include running, weightlifting, ball games and discus. One of the athletes is being crowned champion. It’s as exquisite as it is intriguing. 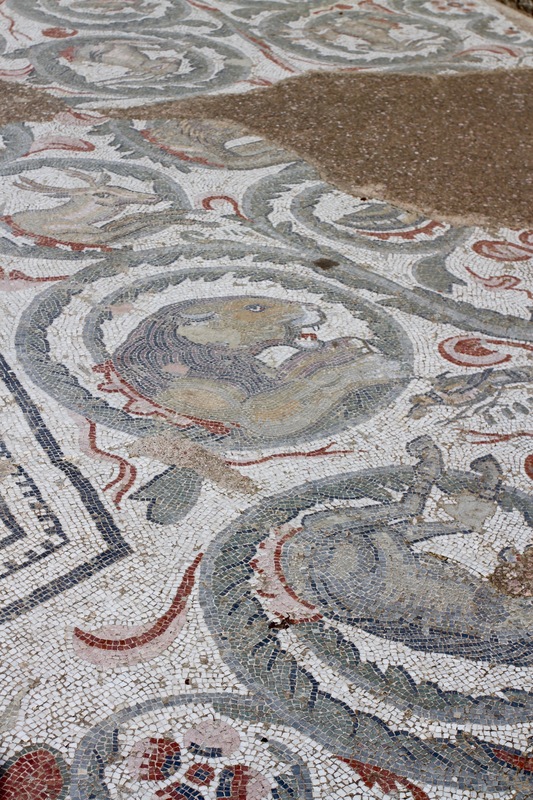 In reality though, there are far more intricate and detailed mosaics in other rooms of the villa. The colourful creations depict all sorts of scenes from literature and real life. 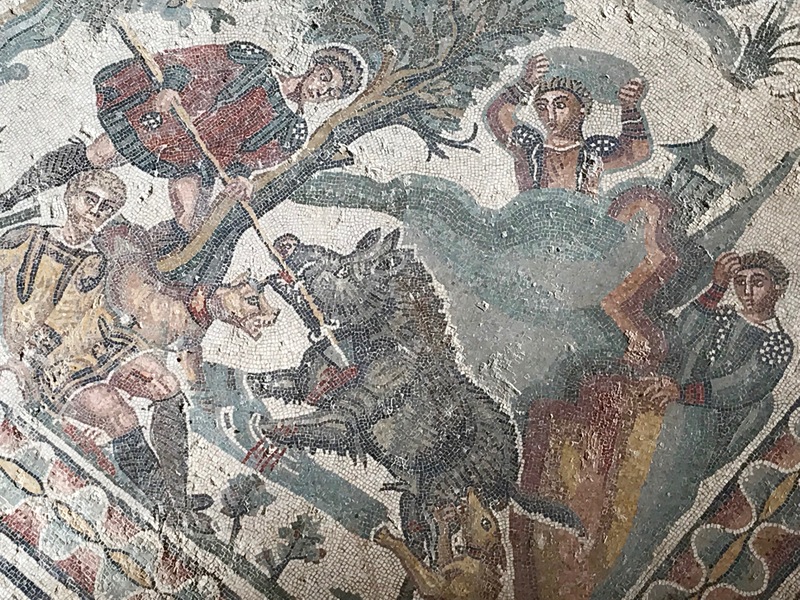 This includes some beguiling mosaics of hunting scenes, one of which shows a wild boar being attacked with dogs and spears while a bleeding and badly injured Roman lays on the floor. 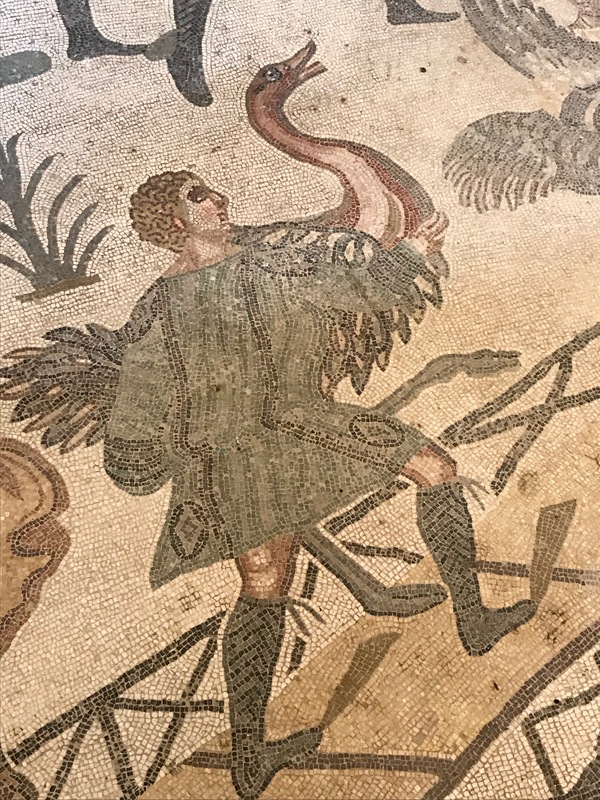 In one only partially preserved mosaic, women wearing what look like chains around their ankles appear to be being abducted. The detail is incredible. Another massive mosaic probably gives more than a hint of the business interests of the villa’s owner. A boat waits in the sea as a range of wild African animals are captured and prepared for transport to Rome, presumably to ‘fight’ in the Colosseum. Lions, elephants, gazelles and a rhinoceros are being captured in dramatic scenes. There is even a tiger being ingeniously caught by using a mirror to lure it into a trap. There are also scenes of lustful lovers, figures from Greek mythology and depictions of Homer’s writings. One remarkable piece shows Ulysses giving Polyphemus, the giant son of Poseidon and Thoosa, a cup of wine. You could spend days here and still not take in all the detail of these ancient artworks. The fact that you can still see them is largely down to luck. After the fall of the Roman Empire, the villa continued to thrive until the medieval period until a major earthquake struck the area in 1169. The earthquake destroyed parts of the building and also caused a mud slide, covering the entire area of the former Roman villa. There the mosaics lay buried and protected from both people, sunlight and natural decay. For 700 years they lay undisturbed until archeologists unearthed them. What lay under the layer of mud must have come as a surprise, and what a surprise. This is an extraordinary and unmissable place, I’d return in a heartbeat.